According to Statistics Estonia, the change of the consumer price index in September 2016 was 0.2% compared to August 2016 and 1.0% compared to September of the previous year. Compared to September 2015, goods were 1.4% and services 0.4% more expensive. Regulated prices of goods and services have risen by 2.2% and non-regulated prices by 0.8% compared to September of the previous year. Compared to September 2015, the consumer price index was influenced the most by alcoholic beverages and tobacco having become 8.5% more expensive, which was mainly due to the implementation of new excise duty rates in 2016. In this commodity group, alcoholic beverages have become 7.9% and tobacco 10.1% more expensive. Electricity, heat energy and fuels also had a bigger impact on the index, as they became 5% cheaper, with 9% cheaper heat energy accounting for almost three quarters of the drop. Compared to the period a year ago, diesel fuel was 5.2% and petrol 1.2% more expensive. Compared to September 2015, of food products, the prices of low-fat milk (9%) have decreased the most, whereas the prices of processed fruit (27%) and sugar (20%) have increased the most. In September compared to August, the consumer price index was influenced the most by the ending of sales of clothing and footwear and the introduction of new seasonal products in stores, but also the seasonal price decrease of vegetables and fruit. Transport also had a bigger impact on the index as plane tickets bought for September were 14% more expensive than the month before. According to Statistics Estonia, in August 2016, the exports of goods increased by 12% and imports by 8% compared to August of the previous year. Export growth was faster than import growth and reduced the trade deficit, which was at the lowest level of this year. In August, exports from Estonia amounted to 1 billion euros and imports to Estonia to 1.1 billion euros at current prices. The trade deficit was 80 million euros (in August 2015, it was 108 million euros). The top destination country of Estonia’s exports in August was Sweden (17% of Estonia’s total exports), followed by Finland (16%) and Latvia (10%). The biggest increase occurred in exports to Mexico, Finland and Germany (up by 33 million, 19 million and 14 million euros, respectively). Compared to August 2015, more electrical equipment was exported to Mexico, more mechanical appliances, optical appliances, wood and articles of wood to Finland, and more electrical equipment and miscellaneous manufactured articles to Germany. The biggest decrease occurred in exports to the Netherlands. The biggest share in Estonia’s exports in August was held by electrical equipment, followed by miscellaneous manufactured articles, wood and articles of wood, and mineral products. The increase in exports was greatly influenced by the exports of electrical equipment (incl. communication equipment), miscellaneous manufactured articles (incl. prefabricated buildings of wood) and transport equipment (incl. motor cars). There was a decrease in the exports of mechanical appliances. The share of goods of Estonian origin in total exports was 71% in August. Export growth was influenced the most by the exports of goods of Estonian origin, which increased 14% while the re-export of foreign goods grew 7%. The growth in the exports of goods of Estonian origin compared to August 2015 was influenced the most by a rise in the exports of electrical equipment, miscellaneous manufactured articles, mineral products, base metals and articles of base metal. Among goods of Estonian origin, the biggest decrease occurred in the exports of agricultural products and food preparations. By country, the exports of goods of Estonian origin increased the most in terms of exports to Mexico, Finland and Germany. The main countries of consignment in August were Finland (13% of Estonia’s total imports), Germany (11%) and Lithuania (10%). The biggest rise occurred in imports from Russia, Germany and China. Compared to August 2015, there was a growth in the imports of mineral products from Russia, of transport equipment from Germany and of electrical equipment from China. The greatest decrease occurred in imports from Poland. In August, the main commodities imported to Estonia were electrical equipment, agricultural products and food preparations, mechanical appliances, transport equipment and mineral products. The growth in imports was influenced the most by increased imports of transport equipment, agricultural products and food preparations, textiles and textile articles. The biggest fall occurred in the imports of mineral products. In August 2016, export prices were at the same level as in August 2015, but import prices were down by 3%. In August compared to July, the exports of goods increased by 15% and imports by 5%. According to Statistics Estonia, in 2015, a household member spent an average of 395 euros per month – 106 euros more than in 2012. At the same time, there has been a decrease in the share of compulsory expenditure in the household budget. According to the Household Budget Survey, in 2015, compulsory expenditure on food and dwelling accounted for 40% of the household budget or 157 euros. According to the previous survey, held in 2012, a household member spent 289 euros per month, of which compulsory expenditure amounted to 45% or 130 euros. Expenditures on food and dwelling are unavoidable in the household budget, i.e. compulsory expenditure, and the decrease of their share in total expenditure shows a rise in the level of well-being because there is more money and possibilities left for other expenditures (e.g. expenditures on recreation, incl. culture and travelling). In 2015, a household member spent the most on food (92 euros per month), which accounted for 23% of the total expenditure. Expenditure on dwelling was 65 euros, on transport 51 euros, on leisure time 42 euros, on housekeeping 26 euros, on clothing and footwear 21 euros and on communication services (Internet, phone and mail services) 18 euros per month per household member. Households in urban areas spent more money on dwellings than households in rural areas, expenditure per household member amounted to 69 and 56 euros per month, respectively. Expenditure on leisure time was also bigger in urban households than in rural households (respectively 46 and 35 euros per month per household member). Rural households spent more on transport: while in rural settlements 55 euros were spent per month per household member, then in urban settlements – 49 euros. By county, the expenditures of households of Harju county were the biggest (449 euros per month per household member) and the smallest expenditures were recorded in the households of Ida-Viru county (279 euros per month per household member). The estimates are calculated according to the data of the Household Budget Survey conducted in 2015. The most recent comparable data are from 2012, in interim years the survey was not conducted. In 2015, about 3,400 households participated in the survey. A household is a group of persons who live at the same address and share joint financial resources and whose members consider themselves to be members of one household. In 2015, a little over 581,000 households lived in Estonia and the average size of a household was 2.2 persons. Mortgage payments, real estate purchases, financial investments, expenses on major repairs or construction and other investments are not taken into account as household consumption expenditure. Most of the risks to the operation of the financial sector in Estonia are low. Although the uncertainty coming from the external environment increased and risks caused by imbalance in the labour market remain, the risks to the functioning of the financial sector are reduced by the financial buffers of companies, the relatively good finances of households, and the high levels of capitalisation in the banking sector. The economy was 0.8% bigger in the second quarter than a year earlier, which is below its long-term growth potential. Value added grew in most economic sectors however, and the main obstacle to achieving potential growth was the decline in value added in energy and mining. Uncertainty about the recovery of external demand was increased by the referendum in the United Kingdom in June in which the British voted to leave the European Union. The direct impact of this on the Estonian economy and Estonian companies will be quite modest. The ability of Estonian companies and households to repay their loans remains good. Labour costs continued to grow fast, with the consequence that corporate profits continued to shrink, though at a slower rate than previously. The contraction of profits has not yet seriously affected the ability of companies to pay, as their loan service costs are low and they have built up financial buffers, which have been kept high because investment volumes have been small. At the same time, rapid wage growth and high employment supported credit demand from households and their ability to loan servicing. Growth in the loan and lease portfolio of the banking sector accelerated in August to 6% over the year. Loans to real estate companies and loans for buying residential property have contributed the most to the increase in the loan stock. The share of such loans in the total loan portfolio is relatively high at 55%, though this has not changed during recent years. Rising incomes and low interest rates create the risk that Estonian real estate prices and housing loans and lending to companies in real estate may start to grow faster. This would make the banks more vulnerable to risks coming from real estate. To guard against excessive growth in the risks from housing loans, Eesti Pank has introduced requirements for the issuance of housing loans by banks, and can tighten those requirements if the risks in the credit or real estate markets should increase. Although credit growth has sped up a little, Eesti Pank is maintaining the countercyclical buffer requirement for the banks at 0% as the debt to income of the non-financial sector has not increased. Eesti Pank forecasts that the rate of growth of bank loans should be similar to the nominal rate of GDP growth in the coming years, and no developments or trends in bank behaviour are in view that would amplify lending activity. Eesti Pank continually monitors whether risks are building up and if necessary it can set additional capital buffer requirements for the banks. The capitalisation of the banks operating in Estonia has remained strong, and this is further underpinned by the capital buffer requirements introduced by Eesti Pank. From August this year, all the banks operating in Estonia have to hold a systemic risk buffer of 1% to mitigate the risks of a sudden fall in the economy, which arise from Estonia having a small and open economy. The two systemically important banks, Swedbank AS and AS SEB Pank, have to hold a further buffer of 2% to hedge against the risks that come from the concentration of the banking sector. In recent years the rapid development of alternative financial intermediaries has been eye-catching in the bank-centred financial sector. Attention has been drawn to the growth in the savings and loan associations, and the activities of creditors and credit intermediaries. The relatively rapid development in the real estate market has been accompanied by quick growth in real estate funds. The risks to financial stability from all these financial intermediaries are reduced by their small size in the financial system as a whole, and their weak links with the rest of the financial sector. The risks from creditors and credit intermediaries were reduced by them being brought under financial supervision. Savings and loan associations do not come under financial supervision and the rapid growth in their membership and the spread of their activities across Estonia could overshadow the original cooperative principle behind their operation and reduce the control that depositors have over their own investment and their understanding of the possible risks. The risks to the Estonian financial sector coming from the Swedish economy remained at a similar level to that of spring 2016. With economic growth relatively fast in Sweden, real estate prices and household indebtedness continued to increase. Swedish bank groups are made vulnerable to a deterioration in credit conditions by the large share of market-based financing in their total funding. If international investors were to reassess the risks from rapidly increasing real estate prices and loans upwards, the financing conditions for the banks could worsen. Funds received from parent banks account for around one fifth of the funding of banks operating in Estonia, meaning they have an important role in the functioning of the Estonian loan market. The conditions of market-based funding have so far remained favourable for the Swedish banking groups. The parent banks of the biggest banks operating in Estonia are subject to high capital requirements at the group level in Sweden, and that has a positive effect on the financial strength of the banks in Estonia. Statistics from the European Central Bank on cashless payments show 220 cashless payments were made per person in the European Union in 2015. This is more than twice as many as in 2000, when 98 cashless payments were made per person. The fastest growth was in the number of card payments, which has approximately quadrupled in 15 years, as an average of 104 card payments are made per person in the European Union. The differences between the payment habits of residents of different European Union countries are quite marked, and the Nordic countries stand out for their large number of cashless payments. Estonia is also one of those countries where residents make more than 300 cashless payments a year. 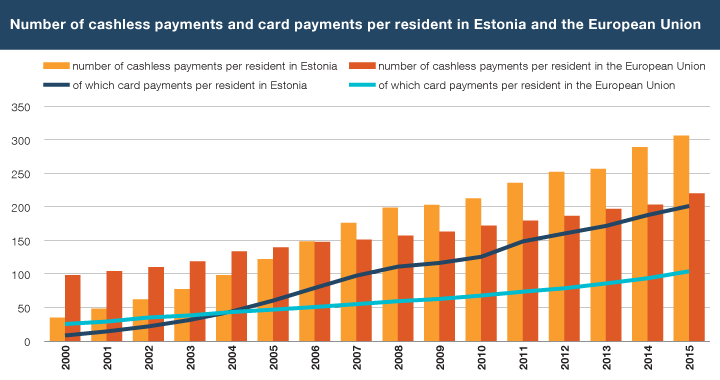 Although the payment habits of residents of Estonia are already quite set, there were still 6% more cashless payments made in the third quarter of 2016 than in the third quarter of 2015. The average Estonian resident makes 331 cashless payments a year, of which 223, or 66%, are card payments. In countries where cashless payments are used more, it is typical that card payments are a large share of the payments. More than 60% of cashless payments in Sweden, Finland, the United Kingdom and Estonia are made by bank card, while in Denmark 81% of cashless payments are card payments. Card payments accounted for an average of 47% of all cashless payments in the European Union in 2015, while 26% were credit transfers and 21% were direct debits1. As some large countries like France, Italy and Portugal still use cheques, payments by cheque account for 2.9% of all cashless payments. In 2000 cheques were still used for an average of 18.7% of all cashless payments in the European Union countries. Paying in cash is so established in many countries in central and Eastern Europe that cashless payments are made only a fraction as often as in the northern countries. In general the changes in payments around the world have been the same as in Europe, and the number of cashless payments is increasing constantly. Within this, the number of card payments is rising and the share of cheques is shrinking. In 2014, 387 billion cashless payments were made around the globe, which was 9% more than a year previously2. The largest share of such payments were made in the USA, followed by the euro area, Brazil, China and the United Kingdom. The number of cashless payment made in China shot up during that year and China overtook the United Kingdom, though payments per resident are still lower in China at 17 per year than in the countries in Europe with the lowest figures. 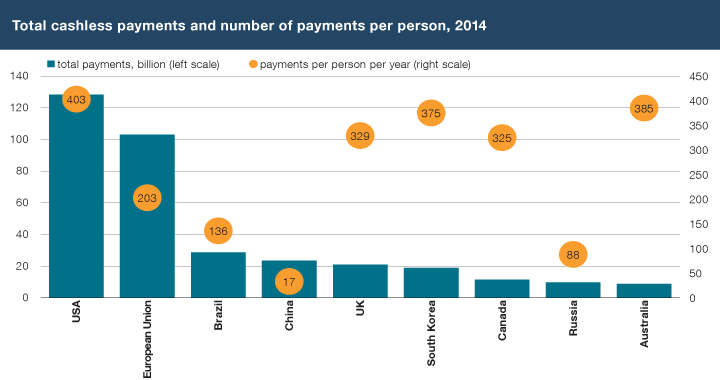 The countries with the most cashless payments per resident in 2014 were the USA, Finland, the Netherlands, South Korea and Australia. More than half of all cashless payments around the world are made by card, and other areas of the world use cards even more than Europeans. 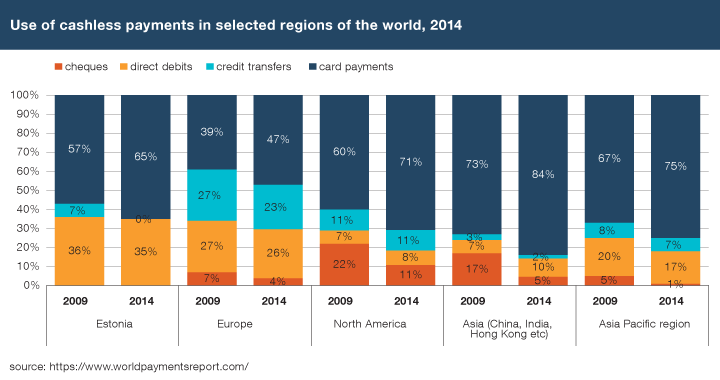 In North America for example, 71% of cashless payments were card payments in 2014, and in the developing countries of Asia, like China, India and Hong Kong, 84% were. 1 Direct debits within Estonia were replaced by e-invoice standing orders in February 2014. 2 Comparable data on all countries are from 2014: https://www.worldpaymentsreport.com/. This is why the comparison of countries uses 2014 data. Minister of Finance Sven Sester has signed a regulation that will allow banks to open current accounts for Estonian residents and e-residents without the need for the customer to visit a bank branch. “We will make opening a bank account easier and faster for everyone, including e-residents,” said Minister of Finance Sven Sester. “We want to make things more convenient, but also maintain the security necessary in the financial sector. The IT solutions that make it possible to identify people from a distance have existed for some time. Allowing for them to be used when bank accounts are opened certainly makes sense. The purpose of the regulation is to establish specifying standards on the basis of the amendments to the Money Laundering and Terrorist Financing Prevention Act adopted by the Riigikogu in June. According to the amendments, identifying a person with IT tools is equal to identifying them by being at the same location as the person or their representative if certain conditions are met. The requirements for the identification and verification of people with IT tools, which are set forth in the regulation, help implement a common standard for all service providers. When the standards enter into force, it will be possible for banks and other financial institutions to identify people without being at the same location as the person or their representative. This must be done with IT tools that allow for the process to be recorded and replayed. This will create a situation on the market where the new identification and verification regime is a preventive measure and helps keep away potential offenders. It will be possible to use a real time video bridge for identification and verification of a person, which makes it possible to compare the image of a person’s face with the data of their identification document and the data of the Police and Border Guard Board. The person will also be interviewed via the video bridge, which will help ascertain the client’s risk profile: assess their background, the origin of their financial resources and the purpose of establishing a business relationship. The entire process is recorded and the recording is preserved. Earlier regulation required people taking part in a transaction or using a service to be identified by being at the same location as the person or their representative. If all conditions are met, identifying a person with IT tools is equivalent to the identification of a person by being at the same place as them. In the case of monitoring a business relationship, for example, the new and information technological solution is an even stronger measure than being at the same location as the person or their representative. Banks will retain the right to identify a person by being at the same location as them. It will be up to the service provider to decide whether they want to open accounts for clients or conclude transactions with them using information technology tools. The service is meant for everyone who holds an Estonian ID card, digital ID or e-resident’s card. The IMF has concluded their annual official staff visit (or ‘mission’) to Estonia. The mission team commended the country’s economic policy and reform plans, but expressed concerns about weak productivity growth. They said Estonia will have to find ways to balance productivity and wage growth and to promote competitiveness. Eesti Pank shares this view. Governor of Eesti Pank Ardo Hansson emphasised at the press conference that Eesti Pank has long observed with concern how productivity growth has been lagging behind wage increases and how corporate profits have been shrinking. “Against the background of overall slow growth both the number of the employed and average wages have increased. Growth has come from labour-intensive sectors, whereas relatively capital-intensive fields of activity such as energy and mining have seen a decline in value added. For the sake of the future of Estonia’s economy, the government’s policy has to be focussed on measures that contribute to growth potential,” Hansson said. Eesti Pank does not think the state should intervene to stimulate demand. “Estonia’s employment and wage growth figures confirm that state intervention to boost demand is unnecessary,” Hansson stressed. Hansson pointed out that the key elements of Estonia’s economic growth are developments in our export markets and the competitiveness and export potential of our companies. “In this light it is especially important for the government to make decisions based on the long-term sustainability of public finances not in the interest of short-term gains,” he said. The IMF’s annual visit to Estonia lasted for a week and a half and ended on Monday. The mission team discussed Estonia’s economic policy, focusing on the reasons behind the country’s weak economic growth. The team was particularly interested in the competitiveness of our economy, the labour market situation, ways to increase productivity, and the role of the state in the Estonian economy.